Firstly I wish to thank Tracy Fenton of Compulsive Readers and Orion Publishing Group for inviting me on this Blog Tour for FRIENDSHIP NEVER ENDS by Ella Dyson. Three troubled women – and one man who lives for drama – haven’t spoken to their old high school best friend in 20 years, after an epic talent show disaster tore them apart during the height of Spice-mania in 1998. Self-appointed gang leader Carmen then decided to go it alone – Geri style. But now, in 2018, Carmen’s high school reunion is fast approaching. 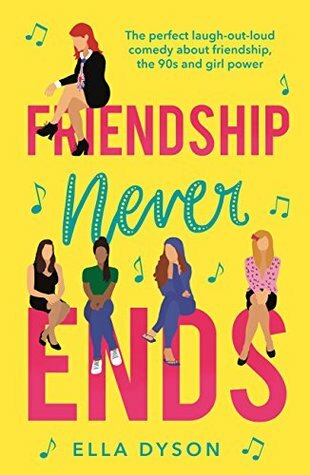 Friendship Never Ends tells the story of Carmen’s plan to win back her former besties – Jemma, Ellie, Laura and Benny – ahead of the big night. But has Carmen really changed? And can their friendship ever really go back to how it was? I love books that spark my brain cells into action and turn back time to my school days because there is one thing for sure, that within a couple of chapters I had put faces to all of these characters. Ok their names were different to the friends I had but each one was clearly there. The one that thought she was always the best at everything, the clever one, the shy one and the one we all Wannabe. We all went to school with them right? In my day the pop stars were untouchable icons but by the late 1990’s boy and girl bands were being put together off the street, they were literally like the girl next door. The Spice Girls hit the pop scene and all the young girls went Spice Girl crazy. Carman was the girl who had everything going for her. She lived in the better part of Huddersfield in a pretty pink house and now 20 years down the line she still lived in the pretty pink house and had swapped school for working on the tills at Sainsbury’s. A chance meeting with an old flame, now a famous footballer, soon cheered her up. He had come back to his home town for the school reunion, he said to her, Say You’ll be There, so nothing was going to Stop her. She would again Let Love Lead the Way. With the 20 year reunion for her former school coming round she was itching to know what had become of the group of friends she had belonged to. She had to get the group back together. The last time was at the school talent night, it had been a very memorable occasion for all the wrong reasons. They certainly hit the Headlines! Could Carman bring the old friends together to put on a redeeming performance of the Spice Girls, or as they were called The Spice Rack? The story is told both in present day and way back in school by Ellie, Jemma, Laura, Carmen and Benny each of them facing the challenges of adult life in their own way but it isn’t long before Carmen is trying to head the group again. The group really need the success in present day to finally have closure on the past and move on. They have to face the question Who do you think you are? before they can be themselves. I really wanted the group to not only come together for one night but Never Give up on the Good Times, that they once had. There are some hilarious scenes in this story and some pretty sad ones too. It is about learning to be yourself and being liked for you not someone you pretend to be but it doesn’t hurt to Spice up Your Life, now and again! Spice Girl Mania~ love it! Sounds like a fun read!